Nike 6.0 and the BMX Crew are at the first stop of the AST Dew Tour in Baltimore. We've created this beast of a machine and we need help coming up with a suitable name. It's a souped-up, tricked out, action sports shred-mobile: part amphib, part 1970's camper, 100% rock and roll. Let's name this thing!! 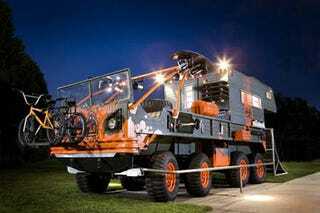 The 8-wheeled ill-mobile is capable of crossing deserts, climbing mountains and taking the team to any secret spot. Racks for bikes, surfboards, wakeboards, skateboards, mean going anywhere for any scene. There's an on deck bbq for grilling up fresh meat, a deluxe camper shell salvaged from a junkyard in remote corner of Oregon and a basement couch for a front seat. Rails to grind are featured on both sides, and a quarter pipe folds down for impromptu sessions. The stereo system requires 2 car batteries, a set of jumper cables and a little luck, but once it's blasting, it's like a stick of dynamite in your eardrum.